Since the 1930s, automobile manufacturers in the world began to think of experimenting on a car that is considered have a futuristic design. Of course this effort done in order to boost the popularity of the manufacturer and realize the dream of future vehicles. Only, some of which it seemed weird and awesome. 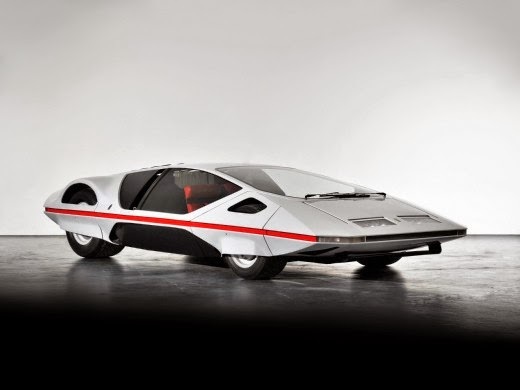 Here are six futuristic (and odd) car design in the past which was introduced to the world. Rushed into production for the 1940 New York Auto Show, the Chrysler Thunderbolt was proclaimed ”The Car of the Future” by the automaker. The Thunderbolt was built with the intention to educate the general public about aerodynamics and streamlining. 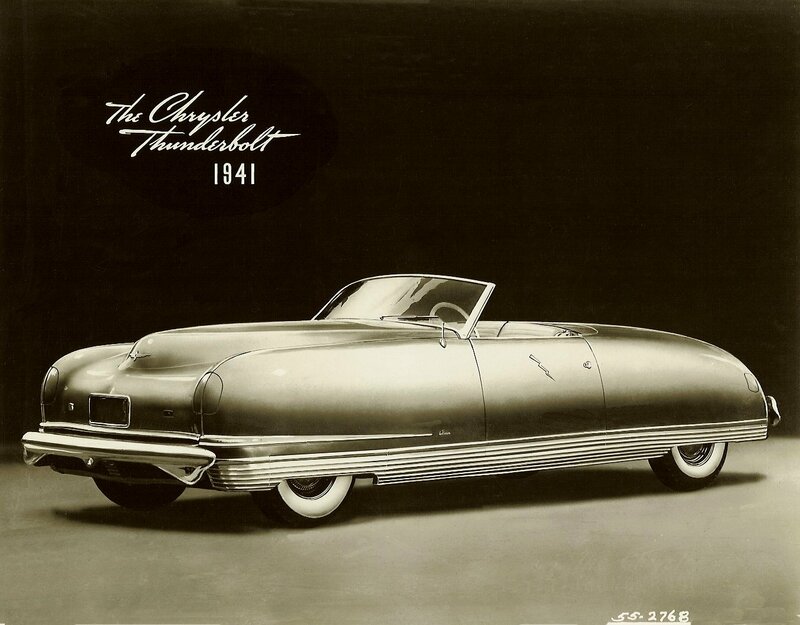 The Thunderbolt was built to minimize wind resistance, so it was a smooth aerodynamic machine in every aspect. The only exterior ornamentation was a single chrome lightning bolt on each door. The aerodynamics were enhanced by eliminating door handles, using concealed headlights, doing away with A pillars, and enclosing the wheel wells. 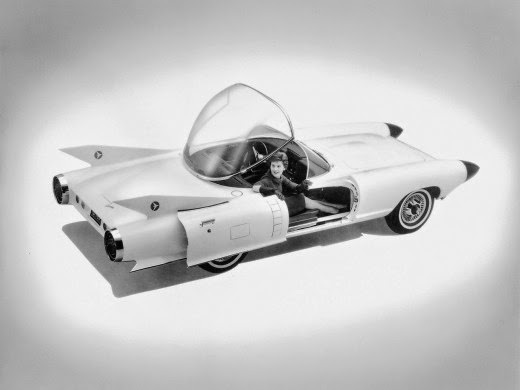 The Thunderbolt featured an all aluminum body and an electrically controlled retractable hardtop. The doors were opened with the touch of a button and the windows were raised and lowered by hydraulics. The Thuderbolt’s interior featured a bevy of leather and push buttons. It was powered by a 323.5 cu-in straight-eight that produced 143 hp. Each Thunderbolt was given its own unique color scheme. 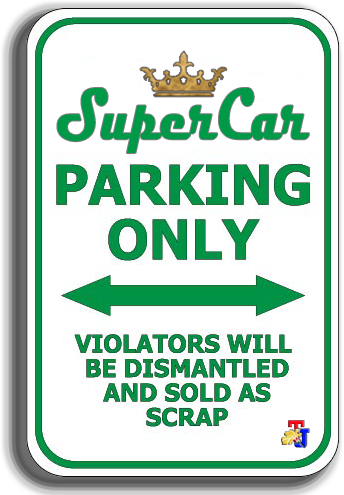 There were only six cars made, with four surviving today. This innovative car was designed by Ralph Roberts and Alex Tremulis and was built by the Briggs Body Works Company. This car is known for its three wheels called L'Oeuf Electrique which means 'Electric Egg'. 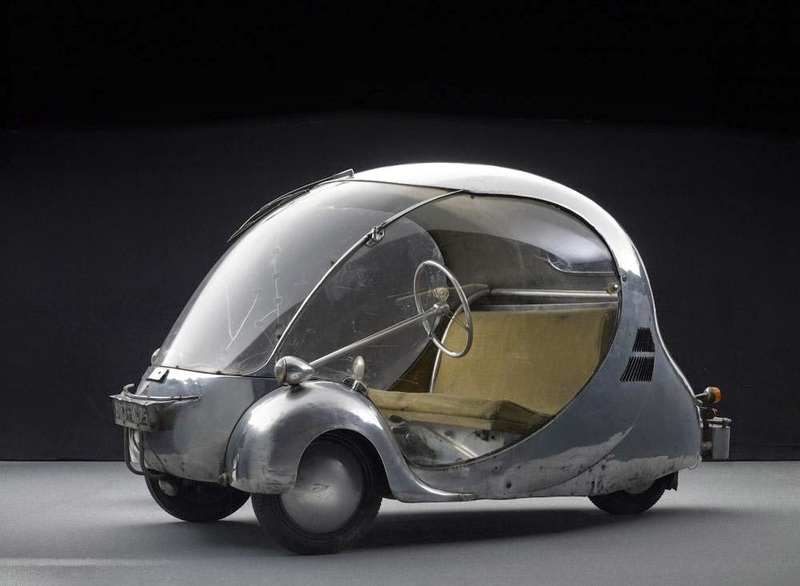 This futuristic car made by an artists, industrial designers, as well as a French engineer, Paul Arzens in 1942. When created, this Egg Car intended for personal / individual in the days of World War II. Since Egg Car appeared, until now a mini electric car continues to be an inspiration for many to develop it. Although Paul Arzens is Frenchmen, but he built an egg similar car in Germany with the existing material at the time. Because the war was raging, Arzens replace the energy supply of gasoline (which at that time was so hard to come by) into electrically based. Therefore, Egg Car is the first car bubble which led to the France made small cars after the war. 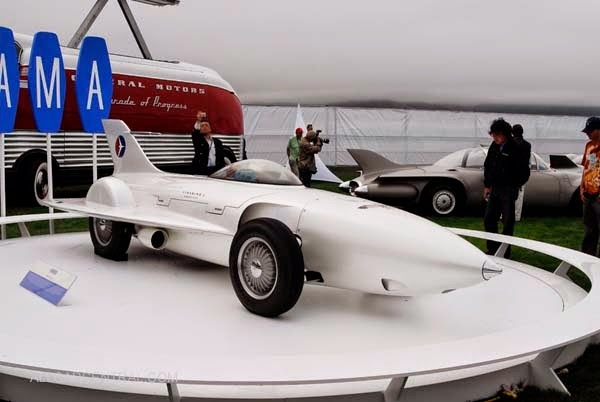 General Motors Firebird was the result of a trilogy of three prototype concept car earlier work of Harley Earl. Firebird was introduced in the show Motorama Auto Shows three editions in 1953, 1956 and 1959. 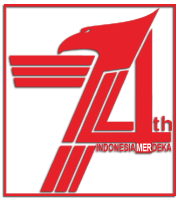 From its shape, it is clear that the Firebird was inspired from the design of existing fighter aircraft at that time. Although a breakthrough, none of the Firebird design made for commercial purposes. This product is only as proof to General Motors for the ideas and concepts of technology development are assessed futuristic car. Today, these cars are stored neatly in the Henry Ford Museum in Dearborn, Michigan, and are often on display at the auto show each event. For the Firebird, General Motors known to successfully solve turbine fuel research done on the car since the 1930's to the 1950's with Emmett Conklin as projecy manager. With this new turbine engine, capable of the speed boost of up to 200 mph Firebird. The Cyclone looked more like a jet aircraft than a car, its two fenders resembling rockets. The two flat door Segments could be slid back. 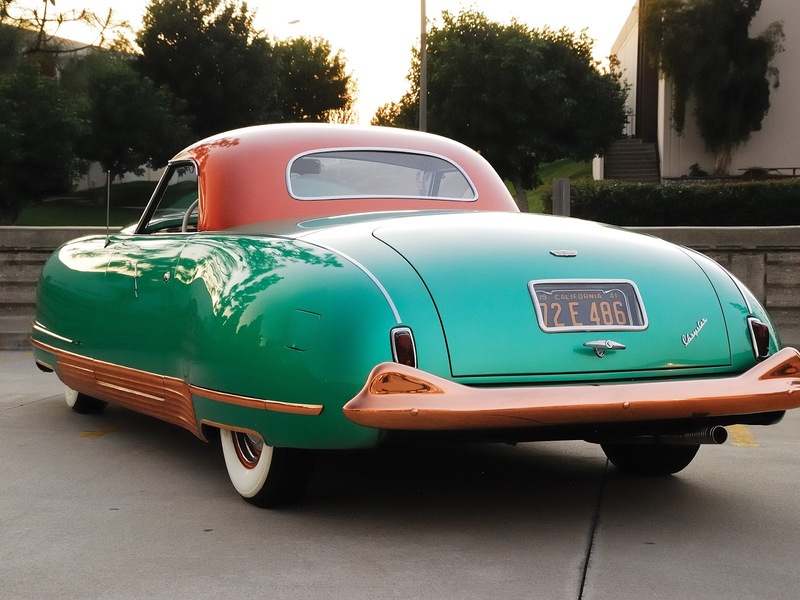 The revolutionary design was matched by the radar-sensing crash avoidance system and the Plexiglas bubble-top that automatically closed when its sensor detected rain. The Cyclone Concept was designed to test styling and engineering ideas. The 2-passenger concept had a clear plastic cover that fit snugly against the panoramic windshield for a true 360 degree vision. When not in use, the power operated canopy folds backward beneath the surface of the trunk. At the touch of a button, Cyclone's doors move outward 3 inches from the car, and slide back smoothly on ball bearings for easy entrance. Among its advanced features is a radar sensing device, located in the twin nose cones, which scans the road ahead, and electronically alerts the driver wîth an audible signal and a warning light if an object is in its path. The dash instruments are clustered like an aircraft dashboard, between the two passengers. An intercommunication system allows the passengers to converse wîth persons outside the automobile without raising the canopy. Built on a 104' chassis, the Cyclone is 197' long and stands only 44' tall; the body is made of steel (not fiberglass, like some experimental models); power is provided by the standard 325 HP engine fitted wîth a low-profile carburetor, a cross-flow aluminum radiator and two fans. The entire exhaust system, including the muffler, are located in the engine compartment wîth exhaust outlets just ahead of the front wheels. 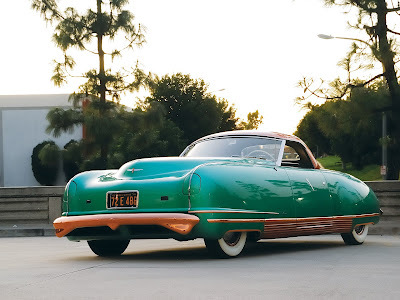 The initial white pearlescent paint was replaced later wîth silver; at the same time, the GM Air Transport logo disappeared from the tall fins, to be replaced by an oblong, vertical Cyclone name badge placed at the extremity of each rear fender. The seats are silver leather. Sports car manufacturer Ferrari had Pinifarina design embodies the concept of man Italy, Paolo Martin in 1970 through the Ferrari 512 S Modulo. Cars with a similar shape submarine was first introduced at the Geneva Motor Show 1970. Chassis of the car is obtained through the development of the 1968 Ferrari 612 Can Am with 0864 chassis. Modulo has a low body with style roof that slides forward like a submarine as the entrance to the cabin. Partially closed four tires and attractive features of this futuristic car is 24 holes in the engine that can generate power up to 550 hp and can run at speeds of 220 mph in 3.1 seconds. Lancia Startos HF (Tipo 829) widely known as Lancia Stratos short. However, none of the most unique designs in addition to types of Lancia Stratos HF Zero. Here HF stands for High Fidelity. Similar unique car concept sports car is currently one of the highly successful race car in his day and had won the World Rally Championship in 1974, 1975 and 1976. Lancia Stratos HF Zero was produced by Italian car manufacturer Lancia and was designed by Marcello Gandini at Bertone City. First introduced to the public in 1970. This car was made for 12 months and was first known when the Turin Motor Show. This car is equipped with a 1.6 L Lancia Fulvia V4. 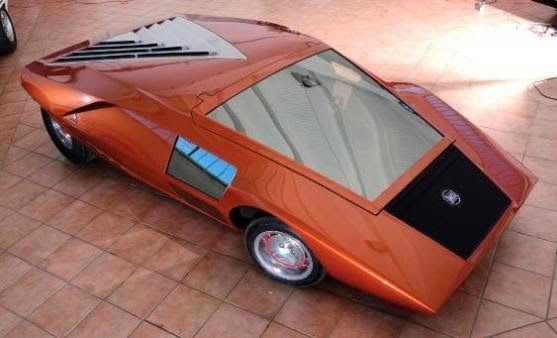 This car has long Bertone Museum occupies a spot in the new year and 2011 and then sold at auction for $ 761.600 euros in Italy.